image courtesy hubspot Some artist blogs attract hundreds of comments, shares, and tons of attention for the artist. Other artist blogs languish in obscurity. Why? In my blog post Content Marketing for Artists, I outline how important it is to build content that attracts collectors to your work. The biggest reason most artist blogs languish is this: no one ever told them how to build an effective blog. Here’s what you need to start to build a successful blog. The biggest mistake that I see art bloggers make is doing a lot of writing about art theory, art history, and specific painting techniques. This is fine if you are a teacher and your audience is other artists. If you are an art collector, however, you may not have as much of an interest toward in-depth tutorials on color theory. Think about who your ideal collectors are. What do they like to read? What are they interested in? Why do they like art? Keep those things in mind when you are creating content. Now, in some cases, this is completely wrong. I know a number of artists who lead workshops as a way of generating interest in their own art. They publish instructional videos and how-to content that gets people interested. The key here is not to go into too much detail, or you lose them. Try testing out some content and seeing what people are interested in, and what gets them excited about your art. A good example of someone who sell art through teaching is Linda Germain. Below is a video of her teaching her gelatin screen printing technique. This works because 1) it’s unique and 2) she shows a very basic way of doing what she does. Obviously her process can be far more complex, with many layers and containing her artistic vision, but Linda does a good job of breaking it down for her audience. You should be approaching your marketing content with the same zeal and passion you approach your art. There’s nothing worse than seeing an artist whose work I really admire, clicking through to their website, and seeing a boring, stale, bland representation of that artist. As an artist, YOU are your brand. Like it or not, who you are is inextricably linked to how people perceive your art. Your probably heard this from your art teacher in college: stop playing it safe! It doesn’t work in your art, and it doesn’t work in your marketing either. If you are a bleeding heart liberal, let that come out in your art and in the way that you communicate. If you are a far-right conservative Tea-Party activist, take that stand and be that person! If you are a sweet stay at home mother, be that person! So many artists tell me that they don’t know what to say on their blog or in their marketing content. My opinion is that 90% of the artists who don’t know what to say are stifling what they truly want to say! This serves no one. Your marketing content should be an extension of your artistic voice. You may be wondering how you can write for your audience when you also need to put yourself into your content. They key is to talk about the things that you want to talk about, but think about how it will be received by your target collector. Ideally, you will be gathering a tribe of people who like your work and your style. By putting your self in your content, your audience will identify with you and with your content, building a solid relationship for the long term! Check out these 7 Inspiring Artists Who Blog for some good ideas on which artists do well online. In Internet Marketing parlance, Pillar Content refers to the content that is the core of your blog. For most big-time bloggers, their first 3 – 5 blog posts are what make up their pillar content. Generally, these posts are 2 – 3x longer than their standard blog posts, because they are packed full of content. Quite often they are instructional in nature, and they are about the core topic of the blog. For artists, this is going to consist of two things: your art, and your point of view. If, like Gwenn Seemel, you are interested in the way animals deviate from sexual norms, then write blog posts exploring those topics. Create videos where you talk about these things. Bring experts on animal sexual activity to your blog and interview them or quote them. Make it about more than just selling your art – make it about expressing the ideas of your art in as many ways as possible. You would think it goes without saying, but yes, you need professional, high quality images of your art. 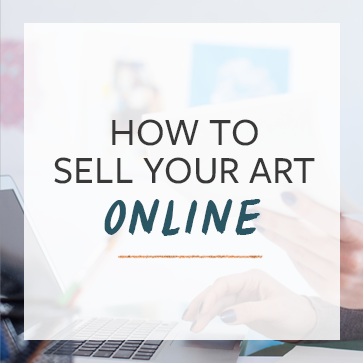 This is an absolute necessity when selling your art online. There are too many other artists out there doing this well. If you have crappy images, your work won’t sell, and when it does, collectors might feel like they didn’t get what they thought they were getting. Be sure to include pictures of your art in every blog post. Even if that particular post isn’t necessarily about your art, including a picture of your art is a great way to show off without having to constantly talk about how great you are. There’s a lot of advice out there that says you should daily, weekly, or three times per week, or … something. The truth is that while blogging on a schedule works for helping your readers know when you’ll have new content, it’s not absolutely a necessity. It’s just one more tactic. If you can blog regularly, it will help. The thing that will grow your blog faster than blogging daily is promoting your content. I’m not just talking about sharing your content on Facebook and Twitter. There are literally hundreds of places you can post your content online. Here are a few good ways to promote your blog posts after publishing them. Don’t focus on building blog subscribers – focus on gaining email subscribers. Sharing your blog posts to your readers via email is probably the most effective way to make sure they come back. Also, once you have their email address, you can let them know you have new art for sale, which is the end goal after all! Email marketing is so important that we are planning on doing an entire series just on how to do email marketing successfully. In the mean while, just remember to use a professional email marketing tool (we often recommend getting started with Mailchimp), ask people to opt-in, develop a lead magnet (something you can give people for joining your mailing list), and then experiment to see what works. The most important thing that you can do is just that – go out and do! Write your blog posts, even if it’s just one, and see what happens. Don’t give up. Keep learning. Try writing guest posts for other blogs to increase your traffic. What other questions do you have about blogging? Want to learn in-depth steps to effective blogging? Want to understand how to tie it together with your other efforts to turn into an art-marketing master? Check out the Content Marketing for Artists Course. Great post. I am in the process of starting a blog. This was helpful and encouraging. Looking forward to more on email marketing. Thanks! Question— how would you incorporate your personal views/message into things if you know that what you believe is not popular with many of your potential customers? Excellent question, and a big one of mine too. This post is one I’ve been waiting for and looking for…I’ve read and studied the whole blogging scenario for what seems like years, but so many of them are service-oriented, not product-based. And I agree that a “how I did this” kind of blog is going to attract other artists, not collectors. So, OK, be myself, write about what interests me and I’m back to Mary’s comment above…what if what I think/believe isn’t popular? Does it matter? Do you have an answer for this Cory? Instinctively I would say that an artist would be more successful, at least to start, by trying to reach the population that has a similar belief system, and then branching out, especially if you are trying to change the world like many of us are! I think that our beliefs show through in our artwork, regardless of if we mean them to or not. It’s part of who we are, and just because another person may not agree with our viewpoint, it doesn’t mean that they won’t like our artwork. David. There are several places you can set up an online presence for free. If you are familiar with navigating the web and know the basics, check out http://www.weebly.com or create a WordPress page, which many artist use as their blog and website for showcasing work. Blogger is another one that allows you to post photos and converse with folks about your work. Hope that helps. I am sure Cory has other suggestions that can help. Extremely helpful and insightful. I am about to build a website for an artist I am working for, I found this extremely helpful. Thanks! Great article! It answered a question that keeps coming up since I started my blog; should I focus more on teaching or on my art? “How To” posts do attract many visitors, but they are not necessarily the ones interested in my art. I think that an artist blog should be focused on getting to know the artist and his work. Loved this post. I fine it’s a fine line between teaching art and selling your art. I like to teach my lampworking foundational techniques to encourage individual expression within each artist. But I also find many lampworkers admire & purchase a certain teacher’s art and many times they take that teacher’s classes, too. So… who you are blogging for can become a blurred line. Very helpful and well organized information. I am just starting an art blog and going about the marketing rather slowly. For artists who post their own artwork, I think it is helpful not to tell everything about the image, as the viewers will create way more interpretations than the artist could hope to. I like to put everything out there for the reader/viewer to understand and appreciate what I do. Would you rather have an art critic put something out there which is not what your art is about? I would have a problem with that so I tell my own complete story about each painting I paint using the least amount of repetitive words possible. The best thing is to read the blogs of many artists and see which one resonates best with you and then keeping that model in mind, make it your own. Thank you for such a useful article. I’ve been writing an art and craft blog since May and am now looking to build up exposure. It’s very encouraging that good, well written content goes a long way to attracting those readers! A great post Cory. Blogging about your art is like keeping a visual diary of what is going through your mind while creating that art or painting. A chance to getting understood and appreciated. It is like giving the idea a distinct voice and sharing your joy with the reader through your story, thought process, where you stand, where you are coming from and what motivated you to do what you did. I totally agree how important it is to put good quality professional photos. We are after all in a visual world…that is our way to “dress for success”. I’m an artist, illustrator, and was an art instructor for over 15 years. I’ve had a couple of solo exhibitions and several joint ones here in Trinidad. which he gave as gifts to friends. I really appreciate the advice, comments and thoughts that are shared on TAA. hasn’t been one of my strong points. I have learned quite a few useful tips so far and I appreciate the service you are providing for us artists. Thank you and I hope that this is going to be a mutually beneficial relationship. Thanks Ian – looking forward to seeing what you do. My first online presence was a Blogger blog. I blogged about my art but also about what inspired me. I shared the work of other artists I loved and had gorgeous photos of things I encountered in my travels from gorgeous seed pods and shells to amazing works of street art and architecture. I posted twice weekly for 12 months and because I loved what I was doing I was never short of ideas about what to write about. My content was image rich with short engaging paragraphs between. I developed a little following who actively engaged with enthusiastic comments. I stopped using blogger because I had run out of my free upload allotment and I decided I wanted to create a web page and that perhaps my money was better spent on having my own blog there with a dedicated url. At that time I read a lot of bad advice about how an artist’s blog should be about the art only and that anything else was “off topic” and would turn people away (because they don’t want to waste time hearing about you and your interests other than your art). Even worse, they advised that sharing the work of other artists was counter productive as you were just going to drive sales to other people. (I like to share, it makes me happy). When I moved my blog to my website I followed the above “advice”. I started to blog a lot less. Why? I work in a very slow medium (hand embroidery) and work in progress posts that are more interesting than a stitch-by-stitch update were by necessity farther apart than possible when working in other media. Also, my internet connection became so slow that it would take one hour to upload a single web-sized image, which was really doing my head in. And so, my website and my blog have languished (no really, you can see the tumbleweeds blowing through). I’d love to say that the slow upload issue was the main problem, but truly, I fell out of love with blogging because I was no longer telling the stories that I wanted to tell (or at least not all of them). A few months ago (before I discovered Cory’s courses) I decided that when I got my new (fast) internet connection installed (delayed from May 30 to July 15!) I would start blogging again the way I used to. If I’m not passionate about my blog, why should anyone else be? Turns out I was right and the “experts” were wrong (who’d ‘a’ thunk it?!). Thank you Cory for giving valuable advice that really works and for reaffirming my instincts that being genuine and generously sharing are more engaging and effective than self-obsessed navel gazing. I loved this article and many others! As a young artist just starting out all of Cory’s content has been so helpful for me. I have one question though, I have a lot of art that is unrelated and kind of random in style and medium. I have just started working in series and focusing on a cohesive style that I enjoy. Should I post pictures of my earlier works, or focus on creating a cohesive image of myself and my art? Any advice is welcome, thank you!